The ‘likeness’ part of a portrait. I feel there’s something not quite right about this drawing. The likeness isn’t right. Also, he looks , well, abit deformed as the features seem tom eto be drawn skew – whiff. Val’s nose isn’t what a call a ‘cherub’s snub’ like how I drew it in the last posting but is in fact a ‘seymour’s beak’, Seymour being my maternal grandfather. It’s an ‘eagle’ type nose which my uncle & my younger brother share. Family traits… I’d noticed it before in my three year old son but of course children’s facess change so much as they grow. Nearly every month. I looked back over the photos of him for evidence of this nose type, & yes it was there all along but ys, it has much changed. What we are talking about here is the ability to identify facial features, that we scan unconsciously for the most part, that go to make up the ‘identity kit’ by which we recognise one person from another. 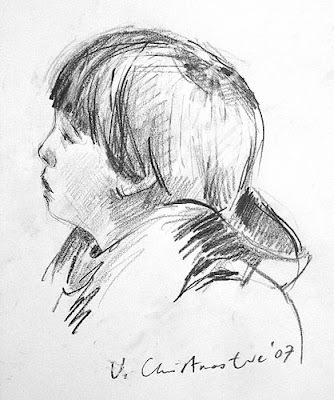 The ‘likeness’ part of a portrait.